A huge fire has hit the French Riviera with the blaze forcing residents to flee homes in the Saint Tropez region. Photos shared on social media show large plumes of smoke above the hills above the posh beach resort region. One resident, Paul Adieannsens, tweeted: "Big fire in La Croix Valmer. "Just made it to escape from our house!" The location of the fire has been described as southeast of the main St Tropez township near the town of Ramatuelle. Water-bombing helicopters were said to be urgently flying over the area in a bid to put the flames out. 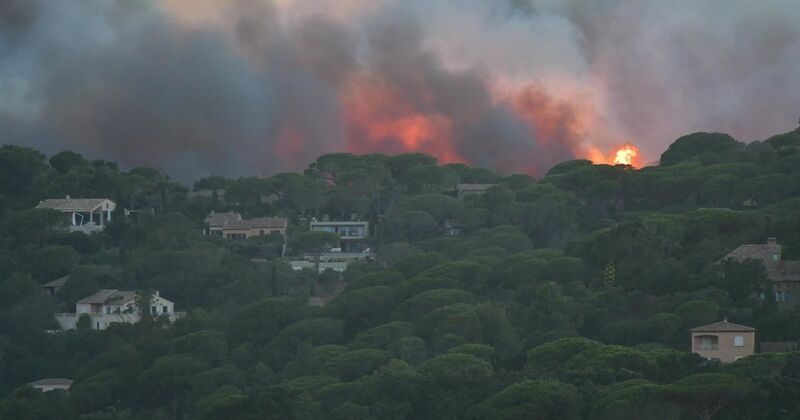 "Mega fire close to St. Tropez," Mirjam vanden Broeke tweeted. Meanwhile hundreds of firefighters were battling blazes across southern France on Monday, with one inferno spreading across 900 hectares of forest and threatening homes on the island of Corsica, emergency services said. "The fire is very fierce and heading to urban areas of Biguglia," lieutenant-colonel Michel Bernier, of France's civil defence forces, told AFP. "We are awaiting reinforcements," said regional deputy fire chief Jean-Jacques Peraldi, adding that around 150 people were battling the blaze aided by more than a dozen fire engines. Local official Gerard Gavory said that three firefighting planes were also involved, and "have been surveying the area to make sure no homes are effected."